The Golden State Warriors currently hold a 2-0 advantage in their NBA Finals matchup against the Cleveland Cavaliers. That success has been accomplished without the services of injured forward Andre Iguodala, but Warriors head coach Steve Kerr indicated on Tuesday that the veteran’s status has been upgraded for Game 3. Steve Kerr says Andre Iguodala is upgraded to questionable for Game 3. Kerr says he’s hopeful he can go. And if not, Game 4 would be the goal. The 34-year-old Iguodala suffered a bone bruise to his left knee during Game 3 of the Warriors’ Western Conference finals matchup and has been unable to play since that point. On Saturday, Haynes reported that Iguodala was able to sprint during the team’s practice, which was considered a significant improvement. Iguodala has been a part of the Warriors for each of their four Finals matchups against the Cavaliers. 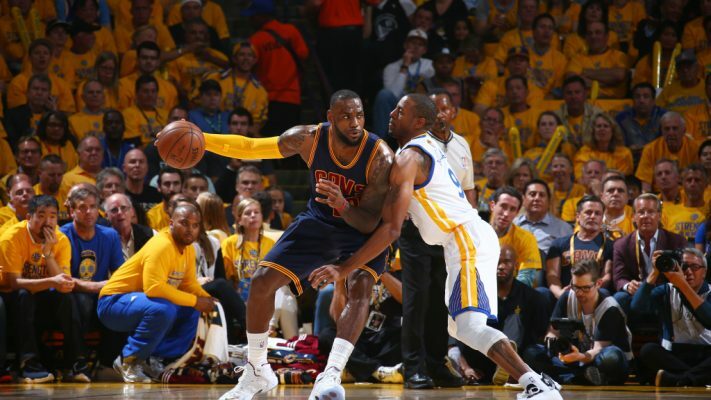 In the first Finals meeting against the Cavs in 2015, Iguodala was named Finals MVP. While Iguodala averaged 6.0 points, 3.8 rebounds and 3.3 assists per game during this past regular season, his main value has been seen as a strong defender against the Cavaliers’ LeBron James. That defensive skill was especially absent during Game 1 of the Finals, when James poured in 51 points during the Warriors’ overtime victory. Regardless of whether or not Iguodala returns, the Warriors can effectively put an end to the series if they win on Wednesday night. That’s because no NBA team has ever come back from a 3-0 deficit in the Finals.